This chart provides a state by state listing summarizing each state's code or statute regarding rest and meal breaks and a brief description of the code or statute. 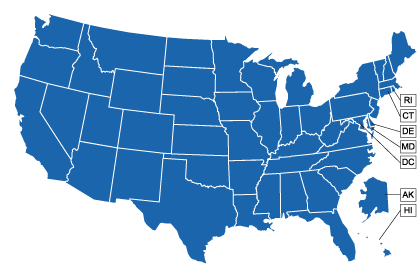 All states are included in the chart. Note: This chart covers only laws that apply to private employers. Some states have laws that apply only to public employers, or have different rules for public and private employers. If you are a public (governmental) employee, consult a local attorney or your union to learn more about the rules and laws that apply to you. Many states also exclude professional, administrative, and executive employees from these rules. Other exceptions may apply. Check the statute or check with your state's labor standards agency if you need more information. No laws or regulations on rest and meal breaks for adults employed in the private sector. Meal Break: Under California law (IWC Orders and Labor Code Section 512), employees must be provided with no less than a thirty-minute meal period when the work period is more than five hours (more than six hours for employees in the motion picture industry covered by IWC Order 12-2001).Unless the employee is relieved of all duty during the entire thirty-minute meal period and is free to leave the employer's premises, the meal period shall be considered "on duty," counted as hours worked, and paid for at the employee's regular rate of pay. An "on duty" meal period will be permitted only when the nature of the work prevents the employee from being relieved of all duty and when by written agreement between the employer and employee an on-the-job meal period is agreed to. The test of whether the nature of the work prevents an employee from being relieved of all duty is an objective one. An employer and employee may not agree to an on-duty meal period unless, based on objective criteria, any employee would be prevented from being relieved of all duty based on the necessary job duties. Some examples of jobs that fit this category are a sole worker in a coffee kiosk, a sole worker in an all-night convenience store, and a security guard stationed alone at a remote site. Rest Break: Employers of California employees covered by the rest period provisions of the Industrial Welfare Commission Wage Orders must authorize and permit a net 10-minute paid rest period for every four hours worked or major fraction thereof. Insofar as is practicable, the rest period should be in the middle of the work period. If an employer does not authorize or permit a rest period, the employer shall pay the employee one hour of pay at the employee's regular rate of pay for each workday that the rest period is not provided. Breastfeeding: Reasonable time to breastfeed infant or to express breast milk; paid if taken concurrent with other break time; otherwise, unpaid. Meal Break: Employees shall be entitled to an uninterrupted and 'duty free' meal period of at least a thirty minute duration when the scheduled work shift exceeds five consecutive hours of work. The employees must be completely relieved of all duties and permitted to pursue personal activities to qualify as a non-work,uncompensated period of time. When the nature of the business activity or other circumstances exist that makes an uninterrupted meal period impractical, the employee shall be permitted to consume an "on-duty" meal while performing duties. Employees shall be permitted to fully consume a meal of choice "on the job" and be fully compensated for the "on-duty" meal period without any loss of time or compensation. Rest Break: Every employer shall authorize and permit rest periods, which, insofar as practicable, shall be in the middle of each four-hour work period. A compensated ten-minute rest period for each four hours or major fractions thereof shall be permitted for all employees. Such rest periods shall not be deducted from the employee's wages. It is not necessary that the employee leave the premises for said rest period. Meal Break: Employees in Connecticut are entitled to a meal break of 30 minutes, unpaid, after the first two hours of work and before the last two hours for those who work seven-and-a-half or more consecutive hours. Employees who already receive at least 30 minutes of paid breaks during the workday are not entitled to an additional unpaid meal break. Meal Break: All employees must receive a meal break of at least 30 consectutive minutes if the employee is scheduled to work 7.5 or more hours per day. Meal breaks must be given sometime after the first two (2) hours of work and before the last (2) hours of work.. Exceptions to the Rule: The employee is a professional employee certified by the State Board of Education and employed by a local school board to work directly with children; or there is a collective bargaining agreement or other employer-employee written agreement, which provides otherwise. Meal Break:Employees in Illinois are entitled to a meal break of 20 minutes, no later than five hours after the beginning of the shift, for employees who work 7.5 or more continuous hours. If you are working fewer than 7.5 hours, no lunch break is required. If you are in a job monitoring those who have mental illness or developmental disabilities, a meal break may not be required. There are other exceptions, such as when meal breaks are established by collective bargaining. As for additional breaks beyond meal time, employers in Illinois aren't required to provide any. There is a minor exception for the Cook County hotel industry, where certain employees are entitled to 15-minute breaks during their shifts. No laws or regulations on rest and meal breaks for adults employed in the private sector. Certain other categories of workers, such as airline pilots, truck drivers, and workers covered by a union collective bargaining agreement may be entitled to mandatory breaks under other applicable regulations or by contract. Check with the appropriate regulatory agency or with your union representative. Not required, but if less than 30 minutes is given, break must be paid. Meal Break: Not required, but if less than 30 minutes is given, break must be paid. Meal Break: Employees in Kentucky are entitled to a reasonable off-duty meal period close to the middle of the shift, and the employee can't be required to take it before the third or after the fifth hour of work. Rest Break:Employees are also entitled to a paid ten-minute rest period for each four-hour work period, and the rest period must be in addition to regularly scheduled meal period. Meal or Rest Break:Employees in Maine are entitled to a meal break of 30 minutes, unpaid, after six consecutive hours of work, except in cases of emergency. Meal Break: Employees in Massachusetts are entitled to a meal break of 30 minutes, if the workday is longer than six hours. Meal Break: Sufficient unpaid time for employees who work 8 consecutive hours or more. Rest Break: Paid adequate rest period within each 4 consecutive hours of work to utilize nearest convenient restroom. Breastfeeding: Reasonable unpaid break time to breastfeed infant or express milk. Meal Break:Employees in Nebraska are entitled to a meal break of 30 minutes off premises for each eight-hour shift. Exceptions: Other written agreement between employer and employees or collective-bargaining agreement. Meal Break: An unpaid meal period of 30 minutes of uninterrupted time shall be authorized for an employee working a continuous period of 8 hours. Rest Break:Rest periods are based on the total hours worked daily at the rate of 10 minutes for each 3 1/2 hours worked. Meal Break:Employees in New Hampshire are entitled to a meal break of 30 minutes after five consecutive hours, unless the employer allows the employee to eat while working and it is feasible for the employee to do so. Meal Break: Employees in New York are entitled to meal breaks. For factory employees, 60 minutes between 11 a.m. and 2 p.m.; mercantile employees, 30 minutes between 11 a.m. and 2 p.m. If a shift starts before 11 a.m. and ends after 7 p.m., the employee gets an additional 20 minutes between 5 p.m. and 7 p.m. If a shift starts between 1 p.m. and 6 a.m., a factory employee gets 60 minutes and a mercantile employee gets 45 minutes, in the middle of the shift. The labor commissioner may permit a shorter meal break, and the permit must be in writing and posted conspicuously in the main entrance of the workplace. Meal Break:Employees in North Dakota are entitled to a meal break of 30 minutes for each shift over five hours. The meal break is unpaid if the employee is completely relieved of duties. Meal Break: Employees in Oregon who work at least six hours are entitled to a meal break of 30 minutes, unpaid if relieved of all duties or paid if employee cannot be relieved of duty. For certain jobs, employees are entitled to a 20-minute paid break, if employer can show that it is industry practice or custom. If the employee's shift is seven hours or less, the meal break must occur between hours two and five; if the shift is longer than seven hours, the meal break must be between hours three and six. However, there are some exceptions to this rule. Rest Break: Employees are also entitled to a paid ten-minute rest period for each four hours or major fraction worked and, if practical, in the middle of the work period. The rest period must be in addition to the usual meal break and taken separately, and the rest period can't be added to meal period or deducted from beginning or end of shift to reduce length of total work period. The rest period is not required for certain solo adult employees serving the public, although they must be allowed to use the rest room. Meal Break: Employees in Rhode Island are entitled to a meal break of 20 minutes, unpaid, within a six-hour shift or 30 minutes, unpaid, within an eight-hour shift. This does not include healthcare facilities or companies employing less than three employees at one site during a shift. Meal or Rest Break: Employees in Tennessee are entitled to a meal break of 30 minutes, unpaid, for employees scheduled to work six consecutive hours or more, unless the work is such that there is ample time for breaks throughout the day. Meal Break: Employees must be given reasonable opportunities to eat and use toilet facilities during work periods. Meal Break:Employees in Washington are entitled to a 30-minute meal break, if the work period is more than five consecutive hours. The meal break should not be less than two hours nor more than five hours from the beginning of the shift. This time is paid if the employee is on duty or is required to be at a site for the employer's benefit. Employees who work three or more hours longer than the regular workday are entitled to an additional half hour, before or during overtime. Agricultural employees are entitled to a 30-minute meal break if they work more than five hours and an additional 30 minutes if they work 11 or more hours in a day. Rest Break: Employees are also entitled to a paid ten-minute rest break for each four-hour work period, scheduled as near as possible to the midpoint of each work period. The employee cannot be required to work more than three hours without a rest break. Scheduled rest breaks are not required where the nature of work allows the employee to take intermittent rest breaks equivalent to required standard. Meal Break: Employees in West Virginia are entitled to a meal break of at least 20 minutes for each six consecutive hours worked, unless employees are allowed to take breaks as needed or to eat lunch while working. Rest Break: Rest breaks of 20 minutes or less must be counted as paid work time. Meal Break: Wisconsin recommends (but does not require) a meal break of 30 minutes close to a usual meal time or near the middle of a shift. Shifts of more than six hours without a meal break should be avoided. If the employee is not free to leave the workplace, the meal period is considered paid time.